Good product leaves no streaks. A handy and reliable addition to your cleaning repertoire, our Furniture Polish Natural 650ml effectively protects all sealed wood surfaces. The multipurpose formula is also suitable for use on electronic equipment and can be removed easily with a soft, dry cleaning cloth. The tall bottle is easy to grip while a simple depression button distributes an equal amount of polish on to all surfaces with a single spray. 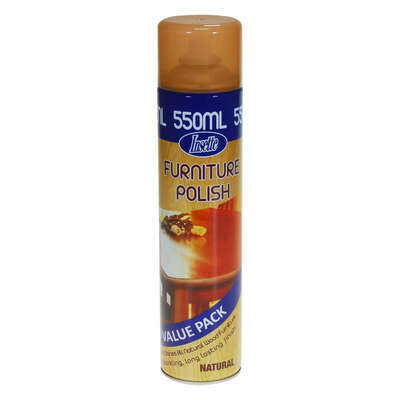 Use this furniture polish to maintain the surface of your treasured furniture and ensure those sticky finger marks and light dirt marks are eliminated as quickly as possible. Ensure all your wooden items are kept looking at handsome as they did on day one with our Gompels Wax Free Polish 6 x 750ml.